This process allows the transfer of inventory between company warehouses and warehouse locations. For information on transferring between bin locations, check out this article. 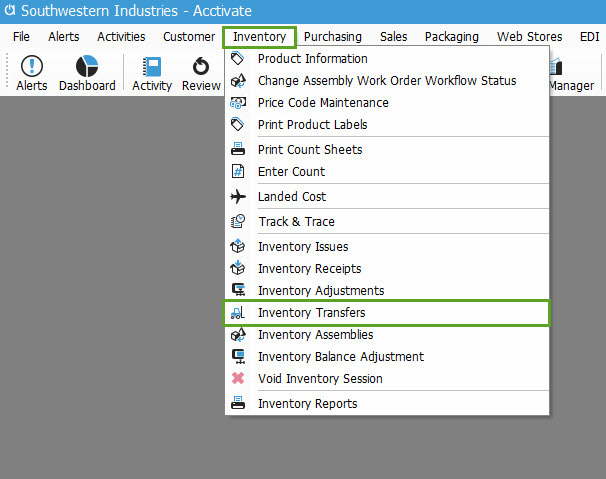 Select Inventory > Transfers on the menu bar to open the Inventory Transfers window. Click the New session button. A new transaction will automatically be created in the session. In the From Warehouse drop-down field select the warehouse you are transferring inventory from. In the To Warehouse drop-down field select the warehouse you are transferring inventory to. Complete all other necessary header fields (i.e. Reference, Transfer Document and Description). In the data grid, click inside the Product ID field and enter the product ID manually or click the Lookup button (to select the product(s) you want to transfer from the Find Product Lookup window). In the Quantity field for each product, enter the quantity. For any Lot/Serial Controlled products you will also need to select the Lot/Serial number that you will be transferring. To view the Inventory Transfers-Transactions Report later, select Inventory > Inventory Reports. 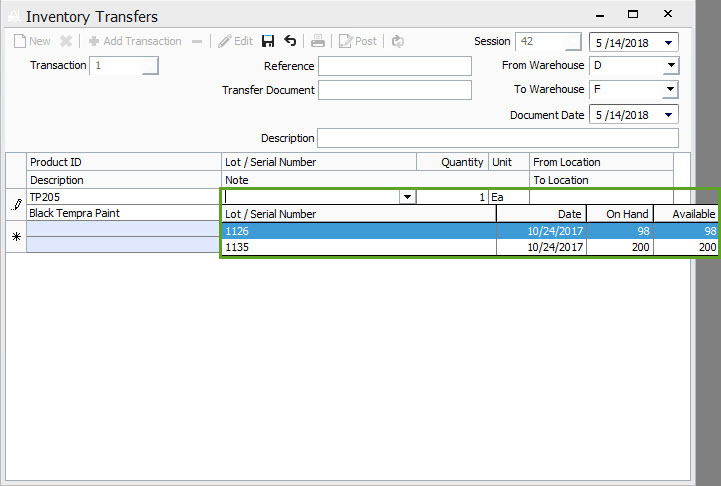 Open the Transactions folder and double-click Inventory Transfers. In the Filter field set the logical operators (All, Between, Equal To, Not Equal To, Greater Than, Greater Than or Equal To, Less Than, Less Than or Equal To, Like, In or Not In) for the session and date as appropriate for the transaction you want to view. For example, if the session number of the transaction is 81 then you would set the Filter field of the session to Equal To and type 81 in the Value 1 field. Since session 81 is the only one you want to view you would leave the Filter field set at All. When you have all the fields set, so that you can view the appropriate reports, Click either the Preview or Print button.